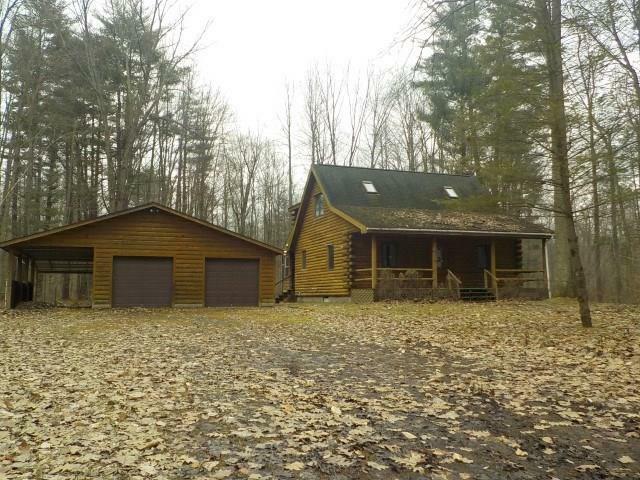 2225 Whispering Pines Lane, Waterloo, NY.| MLS# R1183969 | Coldwell Banker Finger Lakes | 315-789-6768 | Geneva NY Homes for Sale, FINGER LAKES PROPERTIES, Seneca Lake, Cayuga Lake, All of the Finger Lakes. CASH ONLY! This is a must see! 1988 log built home on 1.2 acres. Perfect for outdoor enthusiast. 24 X 26 deep 2 Car garage. Pavilion behind garage overlooking spring fed pond. Open floor plan with large kitchen, Open loft , 2 bedroom, Vaulted great room with propane stuff. This property may qualify for Seller Financing (Vendee) . Directions To Property: Route 14 South. Turn On To Tin Can Alley. Turn Left Onto Pre-Emption Street And Right Onto Steele Rd. Whispering Pines Will Be On Your Right.